Yesterday Saveur Magazine added eat in my kitchen to their “Sites We Love” and I’m so happy and excited to be a part of this special list! It’s only been two months since I started sharing my personal kitchen moments here on my blog and I have been overwhelmed by the response and support, thank you! So, back to food, a special day deserves a special meal! 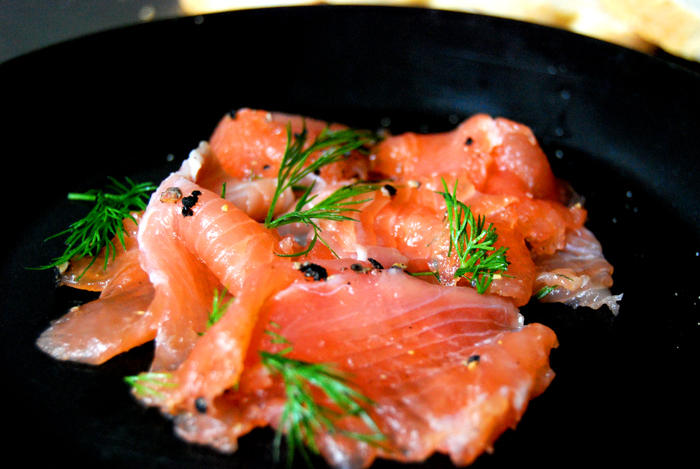 Coincidentally, today I’m writing about a very special, luxurious if not festive recipe, Gravad Lax! Gravad Lax is very literally slow food as the cured salmon needs a few days in the fridge, pressed down with weights, looked after and turned once a day. It can take between 2 – 4 days to reach the right consistency, so you must be patient, but you can be sure you will be rewarded. I cure mine with a marinade of dill, juniper and black pepper and the obligatory salt/sugar mixture. This, to me, is the best way to savor salmon by far. It’s an old family recipe made by many of my relatives, it’s always one of the starters when my family comes together at table. I have tried different recipes, with more spices and orange zest for example, but I always come back to this one. 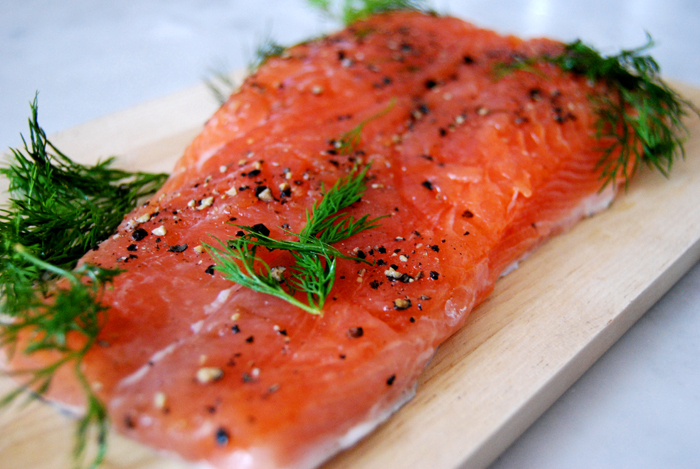 The dill, black pepper and the juniper just bring out the best in the salmon. After a few days, when the salmon is done, I cut very thin slices off the fillet. I serve mine pure, with no dressing, just some white bread. That’s it, it doesn’t need anything else. Apart from a glass of white wine maybe, or Champagne even. It’s a luxurious meal so you might as well go all the way! Combine the sugar, salt and spices. Spread 1/4 of the dill on a flat dish big enough for the salmon. Place one half of the salmon on top (flesh-side up), rub the spice mixture gently into the flesh and cover with half of the dill. 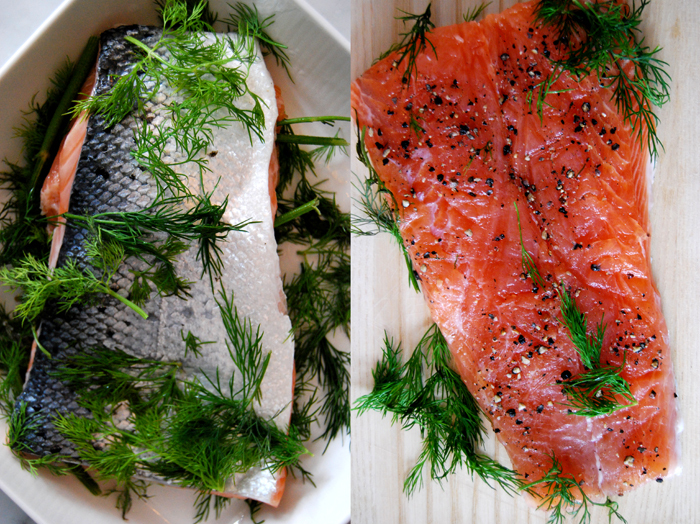 Place the other half of the fish on top (flesh-side down), press it down and cover with the rest of the dill. Cover with cling film, put a wooden board on top and place 2-3 (filled) tins on top, or anything else that is heavy enough to put some weight on the salmon. Place in the fridge and turn once a day. You might have to drain some liquid once in a while. Check after 2 days to see if the texture is already more firm. The salmon will start to look a big glassy. If so, slice it thinly (you must hold a large, sharp knife at a flat angle) – if not, be patient and check again tomorrow! Thank you! I love tuna carpaccio but never tried gravad tuna, sounds interesting. Thank you Kathryn! I like your blog a lot, your photos make me want to bake even more than I already do!